Salmon. Some consider it to be the symbol of our province; many have myths, legends, and cultural beliefs relating to salmon; and others, like me, just thank their lucky stars that they can have fresh locally caught salmon grace their dinner plates every now and again. Salmon is one of the easiest foods to cook. As the natural flavour of the salmon speaks for itself, there is little preparation necessary. Additionally, salmon doesn’t take long to cook – 10 minutes on the BBQ or 15 minutes in the oven – and voila, ready to eat! I have three rules when cooking salmon: 1) always buy it as fresh as possible; 2) buy local and sustainable seafood when available. My recommendation would be to buy it right off the boat (this can be done right here in Steveston at the Fisherman’s Wharf. Prices are great too! ); and finally 3) to keep the salmon moist and flavourful, try not to overcook it. Give this simple and delicious recipe a try. 1. Preheat your oven to 400. Trim the beans by cutting off the stalk ends and leaving the wispy tips on. Halve both of the lemons. 2. Pull out a sheet of aluminum foil, about a yard long, and fold it in half to give two layers. Put a handful of green beans in the middle of the foil. 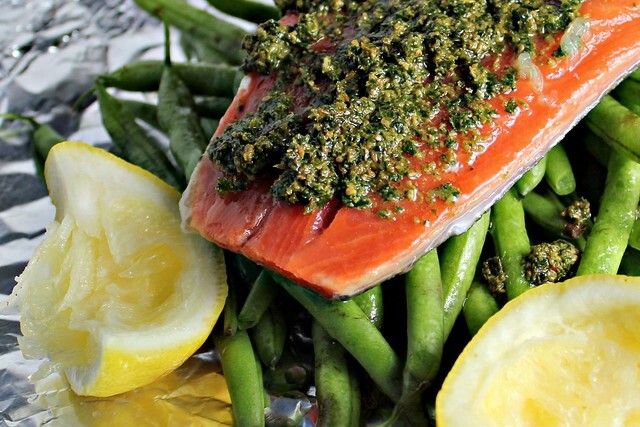 Lay a salmon fillet, skin side down, across the beans and spoon over a good tbsp of green pesto. Drizzle with 1 tsp olive oil. Squeeze over juice from one of the lemons, and season with salt and pepper. Pull the aluminum foil edges together and scrunch them up to seal the parcel. Repeat these steps to make the second parcel. Place both foil parcels on a sheet pan. 3. Put the baking sheet into your oven and cook for 15 minutes. Remove the pan from the oven and let it stand for a minute before carefully unwrapping it. Either serve the parcels on plates as they are or carefully unwrap them before serving.